The other day I started to think about her favourites beauty products and after some research, here there is a list of some of her skincare and make up favourites. For make up she mainly uses brands like Bobbie Brown, Burberry or YSL. She always use browns eyeshadows and the ones from Bobbi Brown seems to be perfect for her. I've read she uses this foundation from Burberry cosmetics and luckily I got a small sample of it. I can't wait to try it out. She also loves Caudalie products as the Vinosperfect Serum or the Divine Oil, two of the Caudalie's best sellers. I really want to try this body oil! 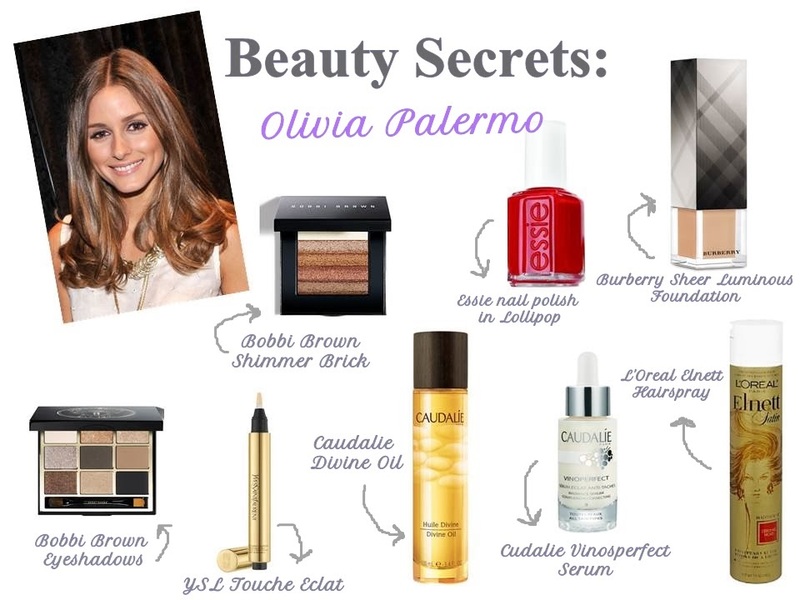 4 comments on "BEAUTY SECRETS: OLIVIA PALERMO"
What do u use to make such pretty collages?? Loved the post!